It’s always been high on my wish list to be able to look out of my kitchen window and see horses grazing in the field beyond. 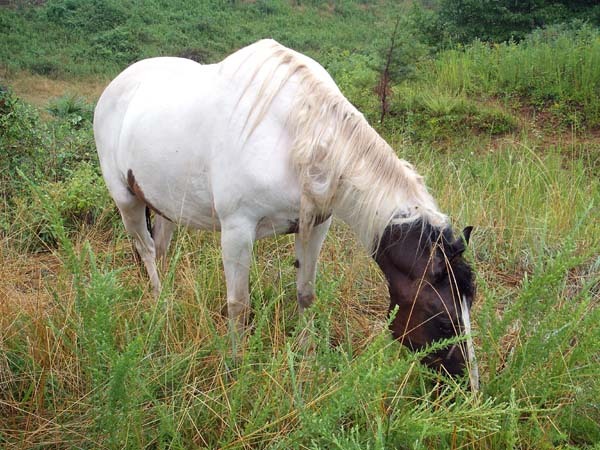 Originally this dream came with the desire to have enough acreage to pasture my own horse. With only one acre to our property, my gaited paint gelding, Journey, is kept on my Dad’s farm 10 minutes down the road. We got some new neighbors last April and recently they brought in their four horses, which I will enjoy watching in the 13 acre field below our house almost as much as if they were my own. 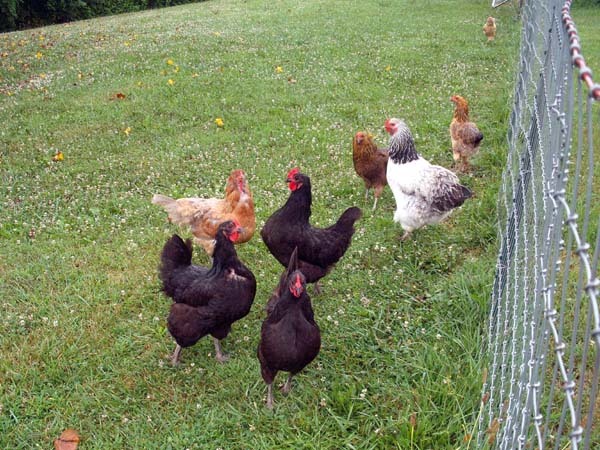 I get to enjoy them without having to pay for their feed and care, which sounds like a good deal to me! 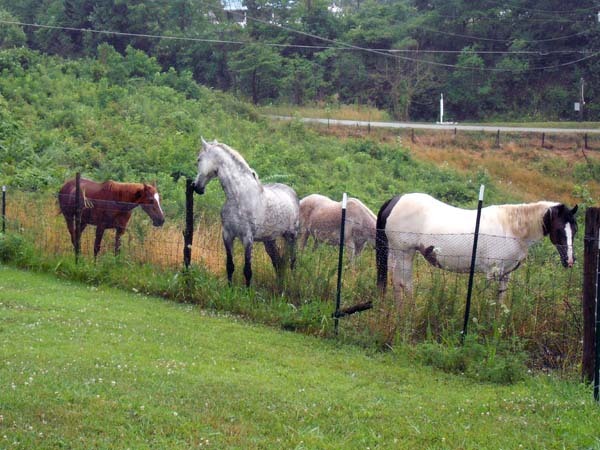 This is their little herd of four mares. It’s been raining a lot lately, but I ran out the door with my camera when I saw they were close enough to the fence line to get some good shots. I haven’t asked their names yet, but will when I get a chance. I have a hard time remembering the kids’ names anyway, so I don’t want to seem overly interested in the horses. Ha. 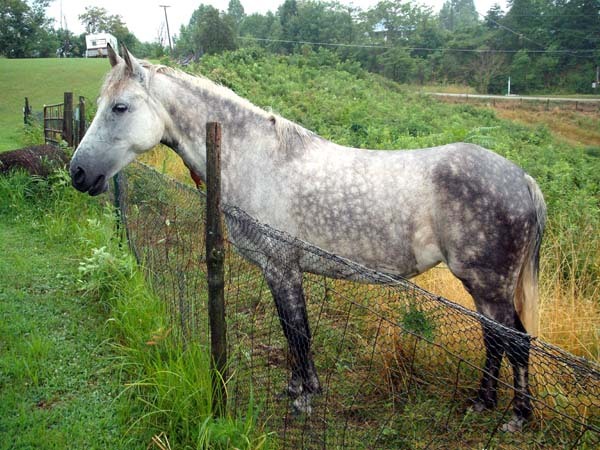 This dappled gray mare is my favorite. Aside from being very pretty, she is also the most friendly (and dominant) of the four. This mare could be the twin sister of my own horse, Journey, except that she is probably 2 hands taller than him. Her markings are brown and his are black, but the placement is very similar. 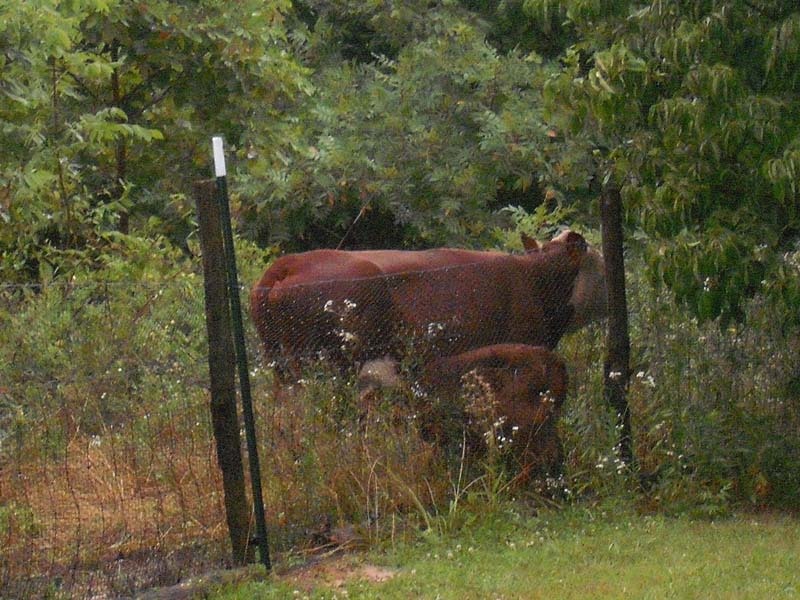 Here is a cow with her calf. 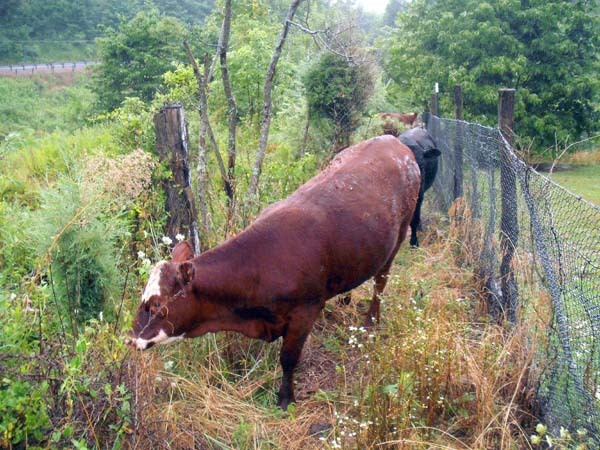 The grass is always greener on the other side! 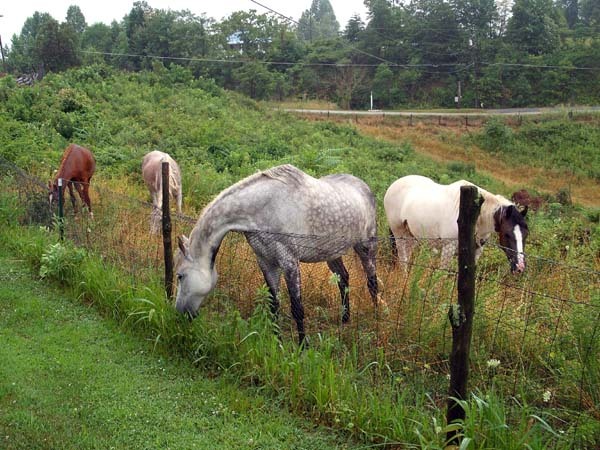 I don’t know how long this fence will hold up to four horses stretching over and frequently scratching their rumps on it. I think they’re going to want to run a strand of electrobraid. It was originally fenced for a couple of dairy goats and for use as a rabbit pen for training the beagles the original owner raised. The field is very overgrown and brushy and it will work great for the goats my neighbors are planning to get to help clear it. I think they are getting “fainting goats”. I’ll get pictures of those too when they arrive.